Boats come in a wide variety of sizes and styles - and as a result, so do boat flags! When you're shopping for a flag for your boat, it can be difficult to know which boat flag size is most appropriate. 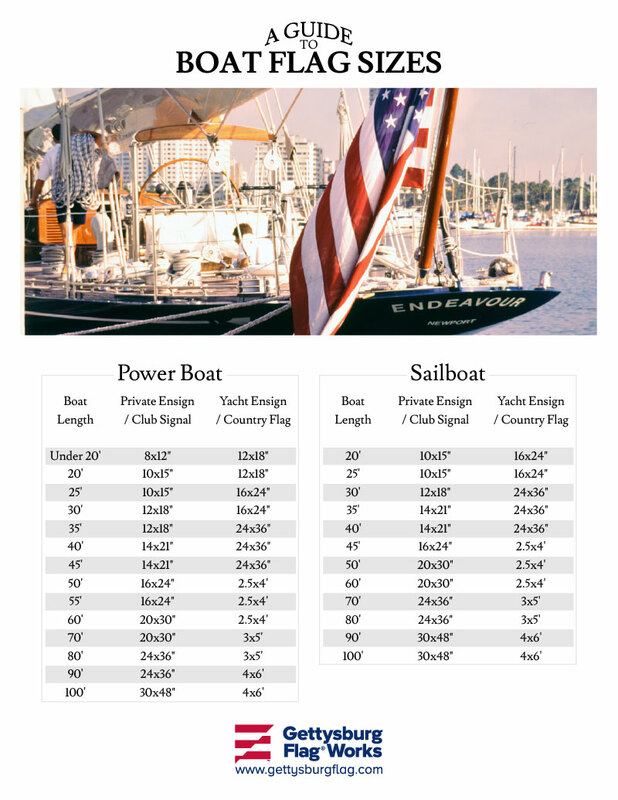 The flag experts at Gettysburg Flag Works have put together a Boat Flag Size Guide to help you choose the right flag size for your boat, whether you have a small fishing boat or a giant yacht. Check out our custom boat flags, nautical flags, pirate flags and other boating flags, then review the guide below to select the boat flag size that fits your boat best! Have questions about choosing the right size flag for your boat? Let us know! We're happy to help you find the flag size that suits your boat best. Just give us a call at 1-888-697-3524 or contact us online and we'll get right back to you with the information you're looking for. Still searching for the perfect boat flag? We carry a wide selection of boat flags! Be sure to check out our nautical flags, pirate flags and boating flags! Want to customize your own unique boat flag? Check out our portfolio of custom boat flags for some ideas and inspiration, then place your order today!